FreshBooks is a cloud accounting solution built for small business owners to get organized and get paid. 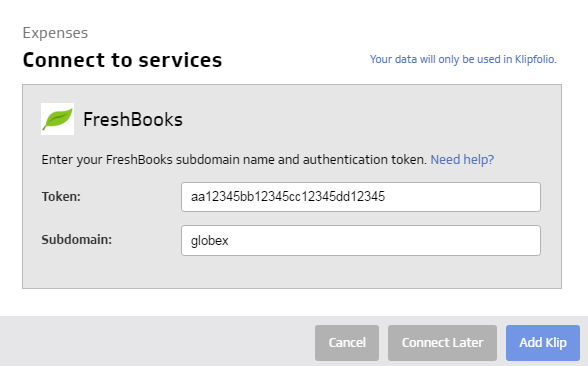 In order to associate your FreshBooks data with your Klip Gallery template, you will need to log into your FreshBooks account and find your Authentication Token and subdomain name. Select a FreshBooks Klip from the Gallery. 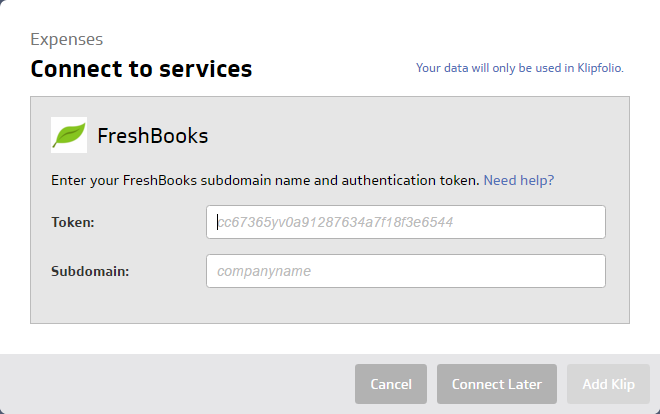 You are now asked for your FreshBooks Authentication Token and Subdomain name. To find this information, in a new tab, log in to your FreshBooks account. In the top right navigation menu, select My Account. At API URL, copy your subdomain name (in our example, Globex), paste into the Klipfolio Subdomain field. Copy your Authentication Token and paste it into the Klipfolio Token field.